Hello! 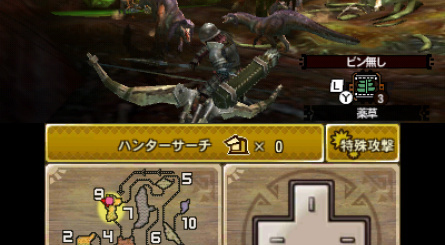 Kerry here, your inept but endlessly enthusiastic guide through the dangerous and thrilling world of Monster Hunter 4. At the behest of the kind and gracious Nintendo Life overlords, I've been locked away in a small room for days on end and tasked with playing as much of the Japanese version as humanly possible, with only short breaks permitted for essentials: going to the toilet, drinking lukewarm water, consuming stale bread and charging the 3DS battery. But fear not! I'm having fun, honest. Each part in this series is going to feature a particular enemy – both old and new – just to give everyone a taste for the game even if they can’t play it themselves. My pain is your pleasure! Or is that the other way around? 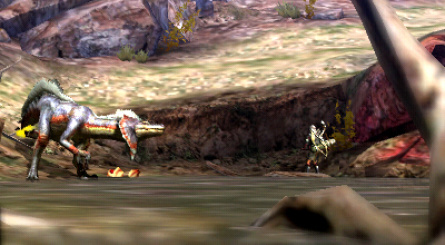 I thought the best place to start would be with the first major battle in the game — a fight against a Great Jaggi at the request of one of Balbare’s residents. 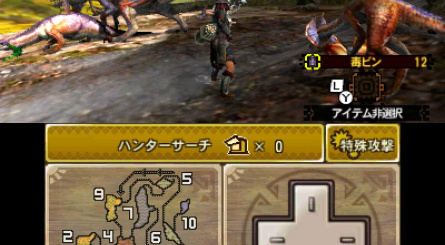 Great Jaggi first appeared in Monster Hunter Tri, but as someone with far too many games and not enough time to play them, this was my first encounter with the beast – how hard could it be? We aren't even in proper Wyvern territory yet, after all. Piece of cake, right? As it turns out, I embarrassed myself completely and brought great shame on hunters everywhere. I’m so, so sorry — please don’t tell anyone. Especially not the Nintendo Life bosses, as they'll cut my food rations. I went in with a bow because hey, I like bows. Bows are cool. Unfortunately, it wasn't until I started the quest that I remembered that I'm about as good with a bow as the average cat is at quantum physics, and the harsh words coming out of my mouth (apologies, Mum) probably did more damage to Great Jaggi than my bad-targeted arrows ever did. That didn't matter though, because I had some backup — pockets stuffed to bursting with potions, paint-balls and other useful things…I assumed they were, anyway. For some reason, when I went looking for a much-needed potion after being knocked about by everything in the area, I found only a huge selection of wet fish in there — freshly caught in the quest before. Oh dear. 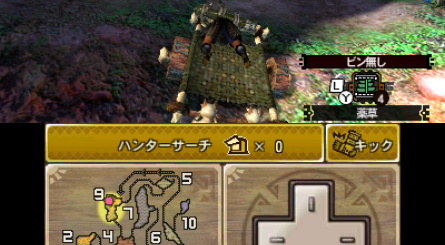 Shortly after, I was treated to my first ride on Monster Hunter 4’s cat cart, unceremoniously dumped at the camp-site and still with a Jaggi to kill. The damned thing was asleep in his nest this time, so at least I could see I’d done some damage to him before he tore me to ribbons (again). My cheap shot to the head while he slept didn't inflict as much damage as I’d hoped for and it wasn't long before I was making a “tactical retreat” to go hunt for some herbs. He did go down in the end, but I'm sure I felt worse than he did. I tried to comfort myself with the thought of the lovely hat his hide was going to make. Did you want to see all of this in action? Well…you can’t, because I didn't record that — it would have been irrefutable evidence of my questionable skill, and I don't want my water allowance to be reduced even further by the kind and benevolent rulers of Nintendo Life Towers. Fear not though, because with Kerry on the case you’re never far from a badly prepared run against even the wimpiest of enemies! Here’s a depressingly similar video of me struggling with Great Jaggi, this time using the Monster Hunter 4 exclusive Insect Staff in an equally incompetent manner. Enjoy, and see you next time, when I've hopefully honed my skills to a more acceptable level and have been allowed out of my isolation chamber for a quick stroll and perhaps even a sleep. 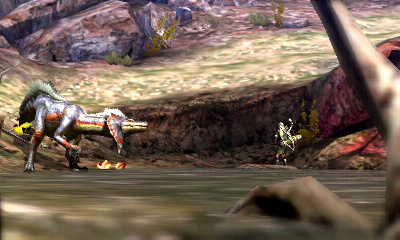 Jumping a Jaggi, how cool is that! Not as difficult as using bowguns (good), but definitely harder than most melee weapons. @Baum897 I think that's the new weapon, the insect staff. And you probably fared far more gracefully than I ever could. These games are not for me. We need a date for the west for this in a direct this month please Nintendo!!! Would be really awesome to just have a list of the new move sets for each weapons, Im quite sure every one except hammer got a new move in its lineup. You get used to it after a while, especially if you make the virtual d-pad a little bigger and reposition it so its more comfortable for you. Underwater is another story however, foraging is fine but its a bit too clunky for underwater combat. @Zombie_Barioth I will give it a honest try down the line, probably when MH4 hits 3DS in Europe. @Shiryu You will be happy to know MH4 has no water fights. but your best bet to fudge it is to simply lock on the Big Monster and just tap the camera recenter. @Warruz No water fights? I don't know whether to be happy or sad. At first I disliked the underwater quests in MH3U but I've started getting used to them and they provide a nice change of pace. Still excited for MH4!! 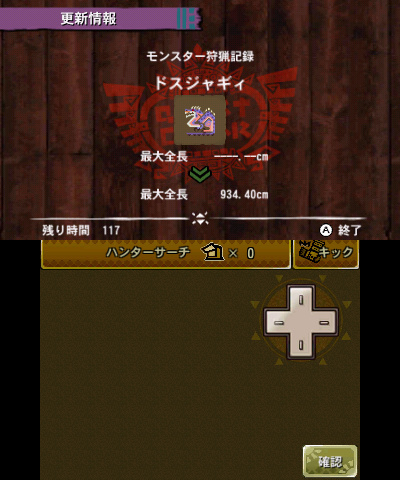 @Shiryu I don't find the camera controls to be that hard to use on the 3DS and I've never used the circle pad pro. Mind you I still haven't played much with range weapons but I've managed to get through all the Moga quests and am almost at G level in Tanzia so I can't be doing too badly. @ted-k yeah, they are the most unenjoyable of the fights MH3 had not to mention thats where the real need for the circle pad pro crops up so it makes sense for them to remove them. Now we get fights that are more focused on different heights within the environment and Bug Monsters to replace Water ones. @YT-SutibunDatsW Lol, never going to happen. Im sure there is a few more minor things I may have forgotten but this is what I know so far. @Warruz Hmm, hope that's not a step back in the franchise, underwater fighting was hard but rewarding. @ted-k Well done, Id say. @Warruz More of a story is definitely welcome. Can't wait for this! @StarDust When it comes to these games, don't give up! It was equally as hard in the beginning for me, too, however I improved by the 2nd and consecutive times hunting the same monster. You have to go into these quests with the mentality that you may or may not be successful this time 'round however you have infinite chances to redo it and you really will get better at it. I have made it to the very last G-rank quests SOLO, darling I have been killed more than 100 times and I still do. My technique is rough-around-the-edges. I will NEVER get thru a quest without taking a lot of damage (unless it's Low Rank, obvs). I hated this game when I first played the demo. Now I've clocked in 775+ hours. 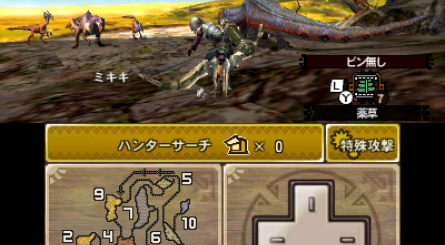 Ultimate was my first entry into the series, and though I am in the G rank, I remember my first tussle with the Jaggi. Of course, it was less than a year ago. It was tense back then, taking so many shots and me making so many poor moves... And then, when the thing finally fell to the ground, such excitement. That thrill was when I fell in love with the series, I'll always have a soft spot for this fella. Trust me, eventually he becomes a pushover, this is a game where real word experience is how you grow. Side note, the second real threat, peco... I'll always love-hate that jerk, he's not the problem, his summoning a deviljho is when I get pissed... >> don't get me wrong, I can handle that guy, but he doesn't make hunting other monsters any easier. 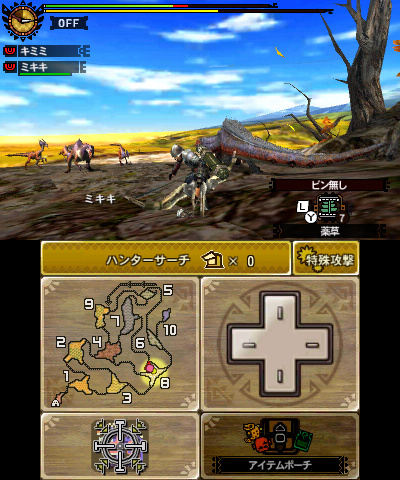 God I want MH4 here! But yeah, can't tell you how many time I died against Barroth when fighting it for the first time in Tri. @ollietaro I can still say, without even playing, that these type games aren't for me. Even most platforming / adventure games I've played, boss battles were my least favorite parts. Many modern games seem to be a bit more forgiving, though. Either way, the entire Monster hunter franchise appears to me just an endless onslaught of monsters that each take longer to kill than most typical midstage bosses. Give me worlds to explore, damsels to save any day, but going into the field to slay dinosaurs all day long sounds both boring and needlessly frustrating to me. Not into kill-or-be-killed type stuff. Can't wait to try Pikmin 3 (yeah I know it's already out but I'm waiting for a price drop: shame on me but money's tight). Why do you insist on teasing us? 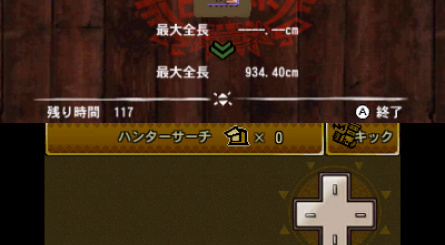 After 850+ hours in MH3U, it got so I could one hit kill a Great Jaggi with my Great Sword. Great times indeed. Give us MH4 Capcom! 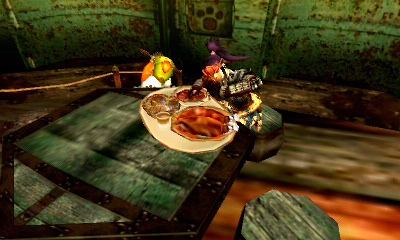 @FlyingKickPunch believe me nothing beats the sensation of beating Great Jaggi in less than 2 minutes with the shaka scarecrows... how can such a weak weapon be so devastating!?!?!?!?!?! Best part of MH4 for me: no underwater fights. Man, they are a drag unless you have Olympic Swimmer and even then its still a drag trying to hit the monster. Its just not fun. Oh snap, look at that new insect staff! I'm first and foremost a Longsword and Hunting Horn kind of guy- although I do like to use the dual-element dual blades from time to time. And the slime dual blades. But those dual-element dual blades, man oh man. Talk about some SERIOUS damgage! 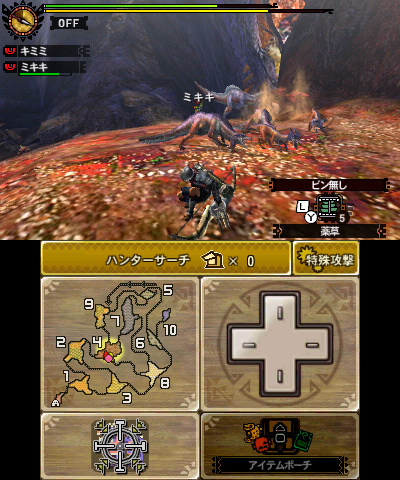 There are only 2 in the entire game of MH3U, one is fire/ice, the other is thunder/dragon. We're talking like 350 raw, another 350 for element one and another 150-200 for element two. Now, you take those thunder/dragon dual blades against Rathian or Rathalos, and they're goin down QUICK. I wanna try that insect staff though. Looks awesome, and I love fast melee weapons. Beats me. 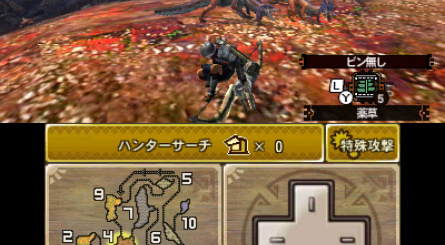 I have the Depths of Midnight Longsword (858 RAW, 160 PAR, and purple sharpness with Sharp +1), and even that thing probably couldn't take down a G Jaggi in less than 2 minutes. The Megrez's Asterism is my poison Longsword (726 RAW, 50% Aff, 200 POI, longest natural purple sharpness of any LS in the game), and that thing works wonders, provided the monster is weak to poison, like Diablos and Black Diablos. I love those two longswords, and when used in conjunction with Status +2 from the Gigginox X armor, it's a very lethal setup. Every article should come with this warning Naw that's too easy. Try upgrading your weapons, and don't use a bow I use sword and shield because of the fast respond time to a dodge and I'm garbage with everything else. Good luck in your hunting! May have to fire up MH3U today. I hope the new one has some water fights. If you see water in the game I hope you can swim and stuff or it will limit the feel of freedom I'm used to with MH3U. So glad to see some Freedom Unite monsters making a return in MH4. 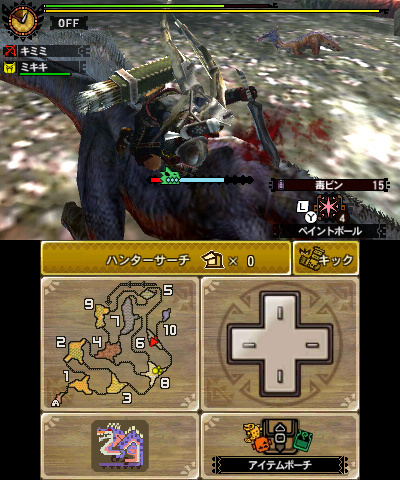 Downing my first Tigrex in Monster Hunter remains one of gaming's highlights for me. And hopefully I'll get to join you, assuming Capcom keeps the servers linked together. It really sounds like Monster Hunter isn't your cup of tea then. The series really is basically a bunch of boss fights, so if you don't care for boss fights you probably won't like it all too much. Theres certainly nothing wrong with that, they're an acquired taste sort of game thats for sure. Why bother when there are others games out there you KNOW you'll like? Kinda funny that you say you aren't into kill-or-be-killed type of stuff, yet you like Pikmin though. With the left shoulder button lock on it really reduces the need for a second control pad or circle pad. 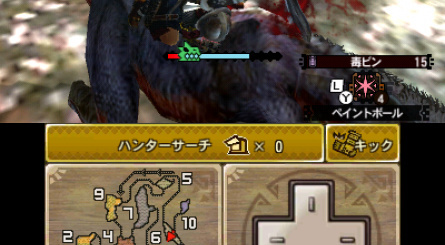 I prefere the lock on even over MH games where i have a dual joystick option. It IS the other way around. Your pleasure is my pain. I want to play this game RIGHT NOW! Well, there's still 3 Ultimate for now. @StarDust I totally understand your playing style but that was my style before discovering MH. This is the first action game I really took to b/c I preferred strat rpgs like Fire Emblem but this game surprised me in such a great way. I don't look at it as a bunch of boss fights. There is a lot of depth of strategy to this game, it's insane. 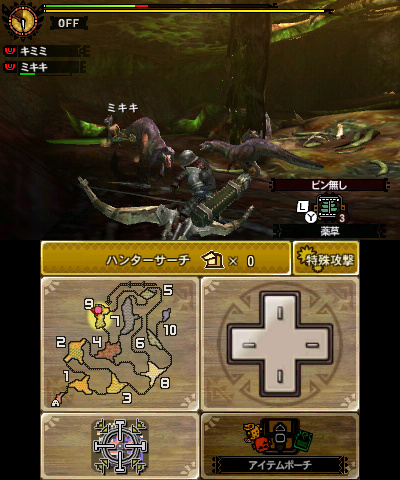 You cannot just press A or X and kill a monster; you must master technique of your preferred weapon and each one has their quirks. And excuse me, but what makes you think there is no exploration in this game? There's plenty. There are six maps of areas such as Tundra and Misty Peaks but b/c there are only 6, each is highly developed and offer depth and detail such as moving, breathing environments. 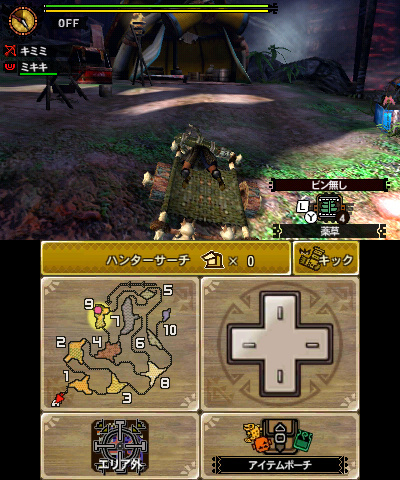 At least play the demo, watch a YouTube video of expert players hunting a fierce monster, and then make your decision. Oh yeah, this game will kick your donkey but humans, we seek out challenges. @ollietaro Maybe it could also be I just don't like gorey games in general. I think it's part play style and part violence. I'm also big into retro. Turok Dinosaur Hunter (N64) was one I tried out and hated. 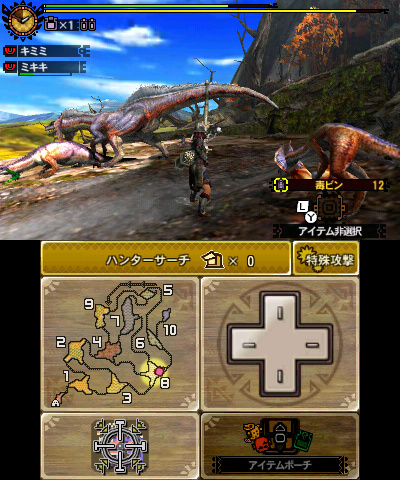 Monster Hunter seems to be a similar concept, even if it's better. I know I previously said I hated boss fights but I just beat Ledgend of Zelda Link Between Worlds Earlier Tonight and I actually had fun fighting through the boss gauntlet, then besting Ganon, but even Ganon seemed like a pushover with Master Sword Level 3 (4x damage dealt) and the red Mail (1/4 damage recieved). I had three blue potions in reserve bottles (revives 100% hearts) but I didn't use a single one. Maybe I should play through the game again sometime on Hero's Quest mode, but I have a feeling I'll get pummeled next time around. I've got Ledgend Of Zelda Link to the Past (SNES) on my back burner, so I'll likely play through that one next.